Note: If you haven't activated the Inbound Phone Numbers feature, read this article to get more context before continuing. 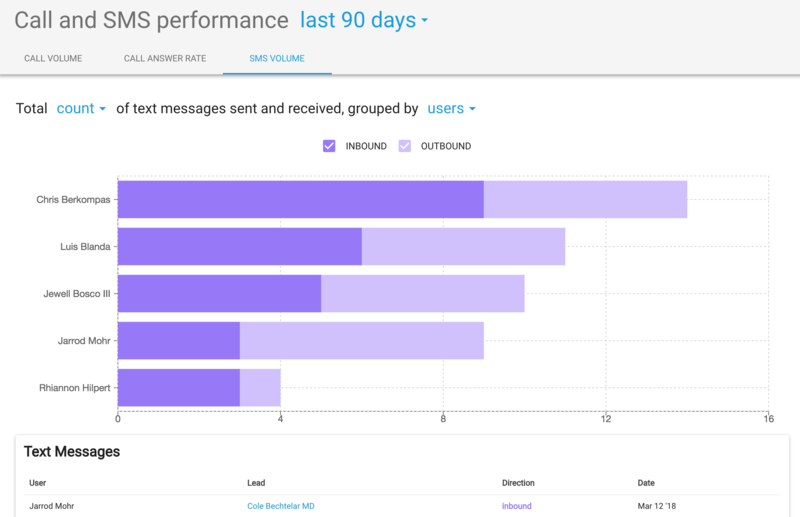 One of the major benefits of tracking all inbound or outbound text messages and calls is being able to use that data to run analytics on the effectiveness of your agents and marketing campaigns. 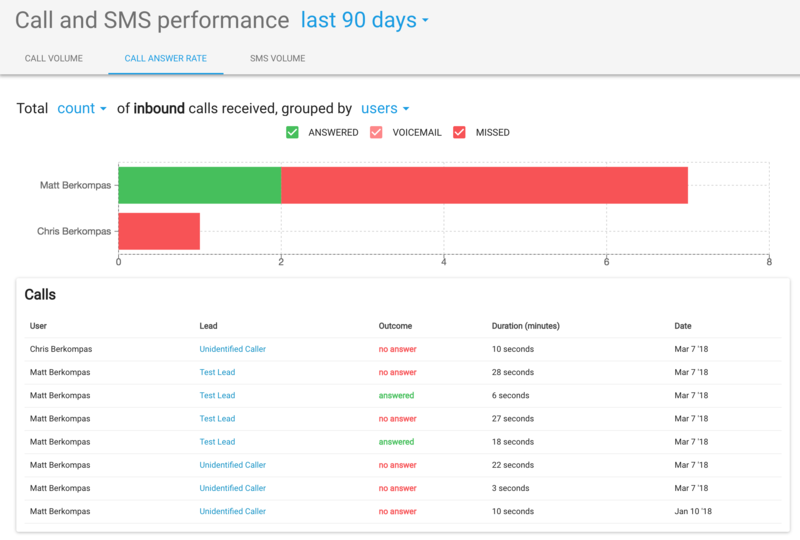 We currently provide 3 reports specifically focused on your call and sms performance. 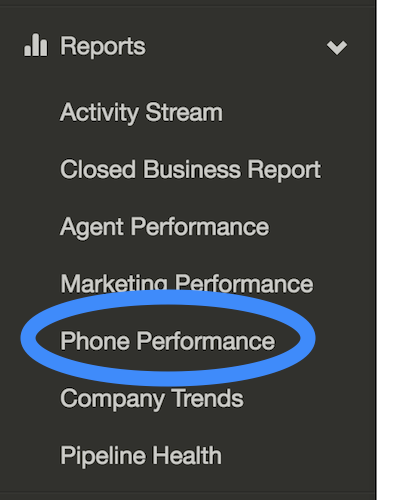 These reports can be viewed by clicking "Reports" in the sidebar and going to the "Phone Performance" section. Note that reports are only accessible to admins so users without admin permissions won't see these links in the sidebar. The on the first report displayed on this page is the "Call Volume" report. 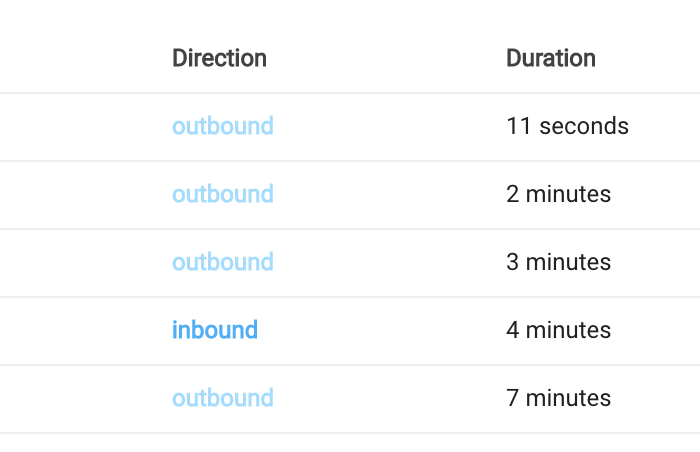 It shows you how many total calls have been made over a given time frame (the time frame can be changed using the dropdown at the top), grouped by User, Lead Source, or the Inbound Number itself. 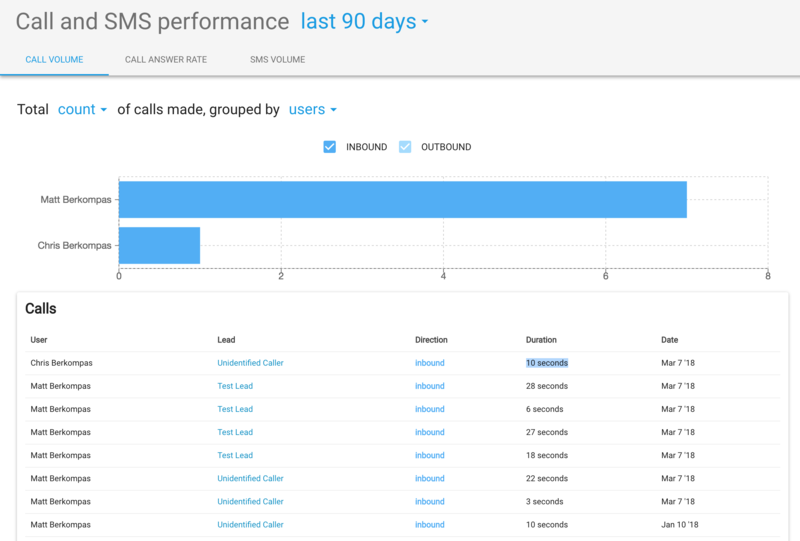 You can also choose to show percentage data, telling you what percent of calls a user participated in we outbound or inbound. This report also differentiates between outbound and inbound calls using color, darker blue signifying inbound calls and light blue signifying outbound calls. One use case for this report would be to determine the effectiveness of one of your marketing campaigns. For example, if you sent out a bunch of post cards this month with an inbound Marketing Number on it, you could group this report by Inbound Number and see how many inbound calls were generated during that time. The second report gives you a picture of how many inbound calls were answered, ended in a voicemail or were completely missed with no voicemail during a given timeframe. This also allows you to view the report grouped by User, Lead Source, and Inbound number. Like the Call Volume report, you can view the count of "Answered", "Voicemail" and "Missed" calls or the percentage. The last phone-related report is identical to the Call Volume report, only this one shows you SMS Volume. The filters and different views for this report are identical to the reports described above. Each report has a list of the call or sms activities below it with a column showing how each one corresponds to the chart above (e.g. whether the call was inbound or outbound).